I tried my hand at the Solomon's Knot. Here is the result. It makes me feel like I'm back in the sixties. ETA: I changed the pics to the right direction. Huge thanks to Jayashiangel for image instructions!!! That's lovely! Gramma's a real hip chick! I'm glad you persevered (I assumed this is the project you were muttering under your breath about in earlier posts). It's very pretty and looks great on you! Very nice! That is a LOT of Solomon's Knots! lol you are an expert on the stitch now! LOL! I wouldn't say expert. You can see why the first rounds needed to lay flat. I.... love it. Definately worth the effort.Great job!! I am partial to the look solomon's knots give, I think they are lovely. Courtney, I love how they look, too. 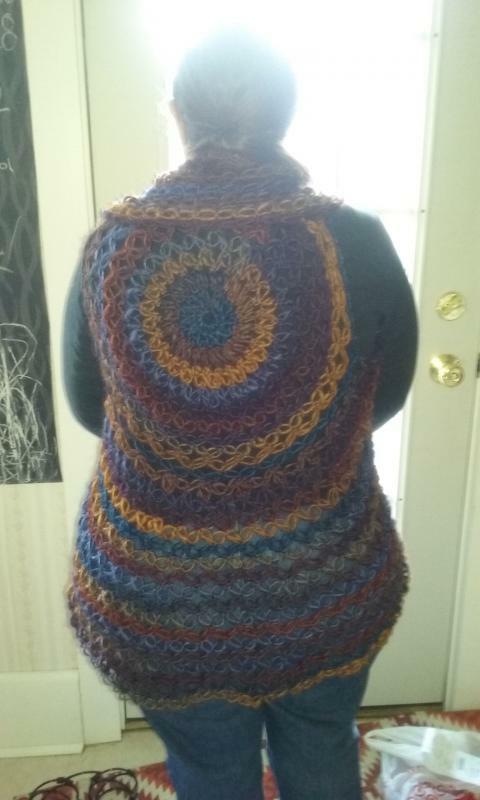 Someone @ yarn group was looking through a booklet of only Solomon Knot projects and I saw the vest. I couldn't resist. Sharon that is very pretty! . I really like that. I never tried Salomon's Knot and from what I read I probably never will LOL. Krys, it's not that difficult to do and it goes quick. The biggest complaint I have is that I can't eyeball the loop size. So, I had to use a measuring tool to make sure they were fairly even. I used my thumb and made the knots too tight on it. It got really sore. That meant I could only do so many a day. 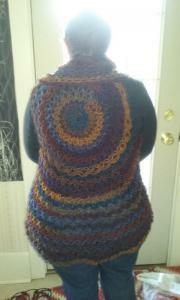 Instead of crocheting for a few hours each day, I was only crocheting for 15-30 minutes per day. 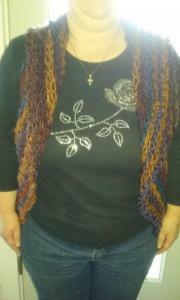 I kept trying to make the loops a bit looser on my thumb, but the yarn I was working with was slippery. Give it a try! You might really enjoy it.